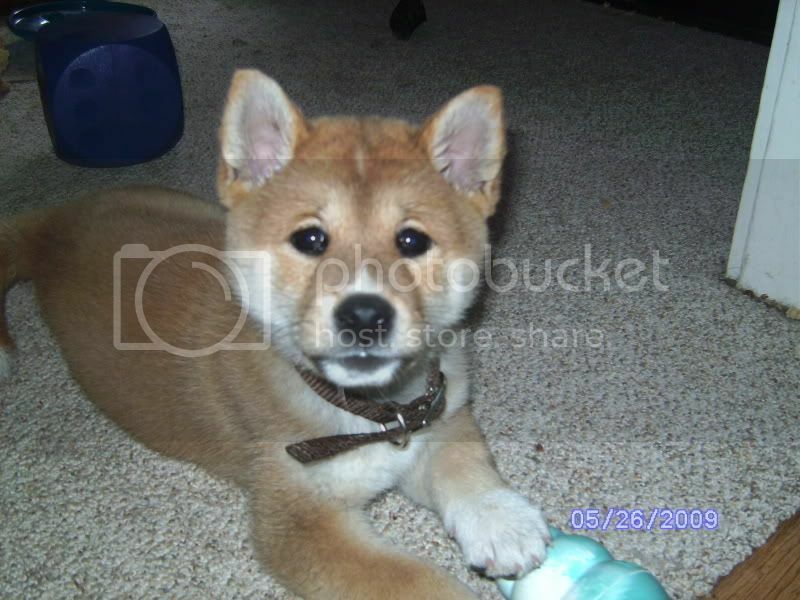 My brother and sister in law are wanting to get a Shib Inu. Does anyone on here know much about them or own one? Through what they have read and myself too, they are very cat like in terms of their nature and temperament and apparently cannot be let off the lead. Personally, there is no point in owning such a breed. I know that may sound harsh, but that's what cats are for, but even they are allowed to be let lose! But the fact that it behaves like a cat is just a little strange to me. Last edited by indianalottie; 08-29-2009 at 01:02 PM.. Some people dislike clingy dogs and people oriented dogs. We have an akita, shiba, and foster shibas. We temporarily had a rescue border collie. The collie drove us insane. She wanted attention constantly, could not entertain herself at all, pooped right in front of the back door, and was always underfoot. The native japanese breeds like the shiba are very clean and independent. They love attention. They go into excited little wiggly circles at getting attention. They will follow you about the house and bring you toys to play with. When you are busy though they go find something to do. Hopefully you provided them with toys because finding something to do could mean eating your furniture if you havent. They poop way out in the back corner of the yard and will even stick their butts against the fence to try to poop out of the yard sometimes. We dont pick up our yard (its not really standard here since many have enough land for a seperate dog yard) and Ive only stepped in poop from our dogs once when I was cutting brush along the fence. We constantly were tracking border collie poo about. When they get dirty or wet forget a bath. Given a blanket to lay on and hour or so left alone theyll lick themselves perfectly clean like a cat. The only time their paws arent clean is when they come bolting in from the yard during a rain storm and excited race around the house for awhile. There are plenty of benefits to "cat dogs" and we will never have anything else again. I grew up with herding breeds and livestock guardians. They all seem annoying now in comparison. I prefer dogs that dont do things just because you said so or are holding something and I like that my akita does not rush up to greet everyone but calmly regards their threat level and then takes up a place to watch. Shibas are a little more outgoing and friendly to the point of becoming spastic when strangers greet them which occasionally annoys me a bit but they make up for it by not acting like small dogs. A well bred shiba doesnt even know its smaller than everyone else. It has none of the small dog complex, does not get defensive or nervous if larger dogs are playing rough, and really just does not act like most small dogs do. Its kind of hard to explain but very noticeable between our shiba from good lines and some imported dogs versus the puppy mill shibas. Weve occasionally called our foster a terrier in a shiba like body because he lacks the usual shiba temperament and instead reminds me of a small dog everytime he does anything. You do really want to research shibas first though. They truly arent a dog for everyone. No they cannot be let off leash. They probably will never learn a reliable recall. Haru does come to squeaky toys if there isnt somthing terribly interesting the other direction. Personally I dont see the problem with this. We just take ours to dog parks or other enclosed areas and hiking with us on leash. Try to teach a cat to pay attention and sit before you try to teach a shiba or any of the japanese breeds (true natives not the fluffy ankle biters they like to breed now). The cat will be easier. Shibas specifically do actually make good agility dogs and similar. They like to expend energy and are more willing to chase balls or frisbees than most of the other japanese breeds. Shibas are probably one fo the least reserved of those breeds. Last edited by Sham; 08-29-2009 at 04:53 PM.. I looked into Shibas before we got Zircon (ironically even though he was listed as a Lab/Chow mix I now have reason to believe that his primary breed is one of the Asian breeds such as Akita, Jindo or even Shiba Inu). They like to kill things and are very aloof. They also make a noise that is called the "Shiba scream." I don't think they're for everyone but this is my kind of dog. This link might be fun to read. The killing everything is one of the funniest quotes off the misanthropic shiba site. Shibas have a high prey drive. High. Greyhounds run, Border collies herd, Labs retrieve… Shibas kill things. Lots of things. Things you didn’t think could be killed, like the toilet seat or your down comforter. By the way, how is your gerbil? Heard the wheel spin lately? I’d better check if I were you. Haru prefers to kill socks and underwear. Occasionally she attempts to kill the dresser but has gotten caught before doing noticeable damage so far. Don't ask me how furniture can be killed. You just have to see it. One of the people emailing us about our foster shiba had 2 couches killed by their last shiba. There's also another site I can't find that says something along lines of "Don't let your shiba off leash unless god owes you a favor. Even then it's not a good idea." To get a shiba you better love their insanities. Same with the other japanese breeds to an extent. We spend a lot of time shaking our heads and writing Zami's behaviors off as "just a silly akita". Especially her odd ways of protesting things. You also better not mind fur everywhere because while you won't hardly see a single hair majority of the year for about 1 month twice a year it will be everywhere. During week 2 of the 2nd fur explosion for the year my desktop died from the dog hair stuck in the fan of the graphics card. I am not familiar with the breed but how fascinating they are! They are a great looking dog. Hi, newbie here I saw your post about Shibas. I just aquired a Shiba and I love him. His name is Sy. He's seven months old and for a puppy he is really a good boy. He is definitely independent but I'm used to that as I also have a Pekingese and they wrote the book on independence. My Pekes name is Sasha she is five years old and I watched her being born five years ago. I also have a Doberman his name is Tuvok he is ten years old. Sy fits right in and they all get along great.